Phlomis fruticosa is a perennial evergreen shrub, growing to a metre in height, with very woolly grey leaves. 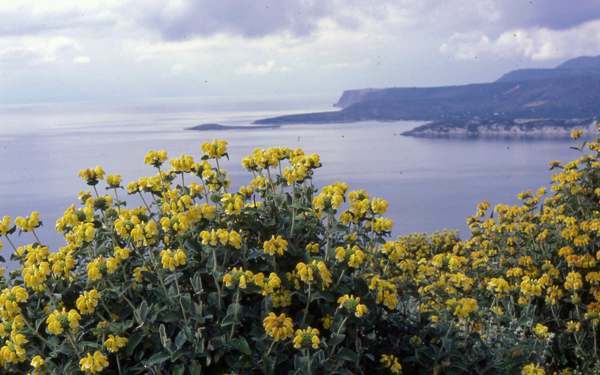 The tubular yellow flowers are typically 3cm long and are borne in whorls above one another. This member of the Mint family occurs in Italy, Sardinia and eastwards including Cyprus. 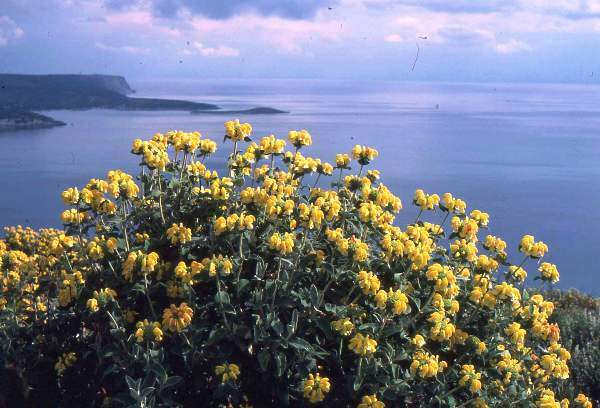 It also grows in Crete, but it is rarer there. Thisl evergreen shrubgrows to a height of 1m with a typical spread of 1.5. The wrinkled sage-like, oval leaves, 5 to 10cm long, are grey-green on top with white undersides; they are aromatic and covered with fine hairs. Tubular two-lipped yellow flowers, up to 3cm in length, grow in whorls of typically 20. Usually there is just one whorl, but occasionally more, on each stem. Jerusalem Sage flowers from April through to June. This striking wildflower is found on coastal cliffs and other rocky places. The specific epither fruticosa is nothing to do with fruit; it means 'shrubby' - in the form of a bush - a reference to the growing habit of this shrub.